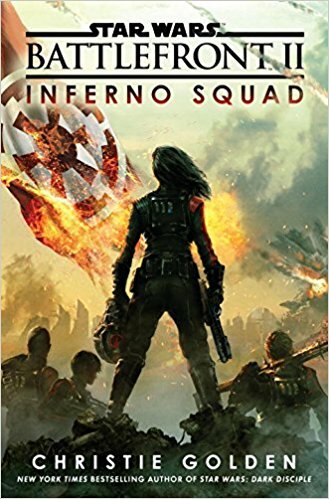 Inferno Squad by Christie Golden is the prequel to the highly anticipated Battlefront II game, and follows the conception of the elite Imperial Inferno Squadron and its first undercover mission. What’s interesting about main character Iden Versio and Inferno Squad as a whole is the idea of humanizing the Empire. Through Iden, we come to find that not all Imperials are heartless and cold-blooded. A good many are, yes, and even Iden is to an extent, but we learn throughout this prequel book that even she carries a moral compass. We really get to see what makes Iden loyal to the Empire, why she does not waiver in her loyalty and service to the Empire. Her motivations are three-fold: Wanting to live up to her Imperial Admiral father’s high expectations, wanting to live up to her own high expectations (which stems from her father, really,) and her true belief that the Empire consolidates its power in the name of peace and justice, while the rebels are merely terrorists whose skewed moral compass is often counter intuitive to their goal. There is much mention of Saw, the events of Rogue One, and the destruction of the Death Star–for which Iden was one of the only survivors. Witnessing the destruction of the Death Star greatly impacts her, and to an extent so does the destruction of Alderaan–but she seems to view that more as justice. Even though we are shown Iden’s somewhat skewed morality, the reader will certainly walk the line of sympathizing with her and being confused/frustrated with her. I think when it comes down to it, we are asked to view Iden’s loyalty and service to the Empire as deeply personal. Her father is a powerful Admiral, and her mother is a propaganda artist. She’s been raised deep within the Empire and its mindset, and perhaps to some extent is brainwashed although she does have independent thought. She’s not just another heartless Imperial officer “just following orders”, and this idea is really exemplified at the end of the book when her resolve waivers and softens enough for her to let an important figure (a character from The Clone Wars, but I won’t say who) live. She even questions her squad mate’s cold-blooded actions at the end of their undercover mission with what remains of Saw’s extremist partisans. Inferno Squad has a lot of call backs to The Clone Wars, Catalyst, Rebel Rising, and Rogue One, which really helped position this story within that frame of reference and also helped flesh out the world and political climate in which these characters live. Although we are given enough character development to believe Iden’s motivations, I had a hard time understanding the motivations of her three squad mates. Two of them show brief moments of sympathy for the partisans they have embedded themselves with, and the other seems to not care at all because he is a hardened soldier. Ultimately, I could only surmise their loyalty and service to the Empire was due to the standard brainwashing of officers and soldiers at a young age. Perhaps we’ll get more there in the game. Stylistically speaking, I found the first half of the book to be slow. I know Golden does a lot of tie-ins and has to write to appeal to a commercial market, so one expects not to get any really hard hitting prose. But canonically speaking, it did its job for setting up the events to come in Battlefront II. I am eager to know if more members join Inferno Squad, and if Iden or her squad mates will do something or witness something that will fully turn them away from the Empire. I also wonder if we will see the man she let live.